I am extremely humbled and delighted to be awarded the ASCE Excellence in Journalism Award. While there is always much more to be done, it’s really wonderful to see an organization like ASCE take the time to celebrate the hard work and dedication of so many involved. 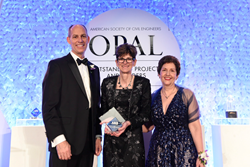 Robin Kemper, 2019 president ASCE, and Tom Smith, executive director, ASCE, handed Smedley the award for her outstanding journalistic achievements to enhance the public understanding of the role and impact of civil engineering. The ASCE also awarded the Charles Pankow Award for Innovation to Autodesk BUILD Space Technology Center in Boston, the Henry L. Michel Award for Industry Advancement of Research to Richard Tucker, five OPAL Leadership Awards in construction, design, education, government, and management, as well as five outstanding civil engineering achievement (OCEA) Finalists from which one winner was named: 150 North Riverside, Chicago, Ill.
“I am extremely humbled and delighted to be awarded the ASCE Excellence in Journalism Award. While there is always much more to be done, it’s really wonderful to see an organization like ASCE take the time to celebrate the hard work and dedication of so many involved,” says Smedley. In 1994, under the leadership of then President James W Poirot, ASCE established the Excellence in Journalism Award to honor newspaper journalists for outstanding articles that enhance public understanding of the role and impact of civil engineering in designing solutions for clean water, transportation, the environment, and other public works projects. In 2006, the award was expanded to include journalists and producers from English-language, general-interest regional and national newspapers, radio and television stations, magazines, and electronic and Web-based news outlets. More than 20 years ago, Smedley launched one of the most formative media companies to help businesses understand how disruptive and innovative technology will help them navigate the flood of digital transformation so they can remain viable and competitive. Today, she is passionate about addressing the infrastructure crisis that is happening by adopting a new vision and voice for the industry. Specialty Publishing Media is home to Constructech magazine, Connected World magazine, The Peggy Smedley Institute, The Peggy Smedley Show, and Constructech TV. With content spanning print, online, radio, podcasts, and streaming video, each interactive platform delivers audiences the latest in the technological revolution. Headquartered in Reston, Va., it is the oldest national engineering society in the United States. The American Society of Civil Engineers represents more than 150,000 members of the civil engineering profession in 177 countries.